Your favorite song comes on the radio, so you reach over to turn up the volume. You hear a cry from the backseat and take a quick look to check on your infant. You reach for another bite of breakfast on your way to work. While each of these actions is only a minor distraction that most drivers consider generally acceptable, you should know that each one of these common driving distractions has the potential to cause a serious St. Louis car wreck. Most recently, texting has become the biggest threat to drivers. Experts estimate that a person driving 55 miles per hour can cross the length of an entire football field in the time it takes to read or send one short text message. Because texting uses your eyes, hands, and mind, it takes an enormous amount of attention away from driving. One study showed that texting makes a person 23 times more likely to get involved in a serious Missouri car accident. Most states have some sort of ban on texting while driving. In Missouri, that restriction only applies to drivers under age 21. Distracted driving in general, and texting specifically, has become such a widespread problem that the Department of Transportation launched a website aimed specifically at stopping this epidemic. Distracted.gov offers sobering statistics on driving distractions nationwide and provides ways for local communities to take action to cut down on the number of distraction-induced accidents. If you have been the victim of a St. Louis car crash where distracted driving was the culprit, you may be eligible for compensation for your injuries. 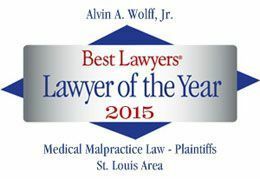 For a free consultation or to order your complimentary copy of the guide How To Pick a Lawyer, call St. Louis car accident attorney Alvin Wolff, Jr., toll-free at 877-241-1020.